The oblong, bright-red fruit of the goji plant. 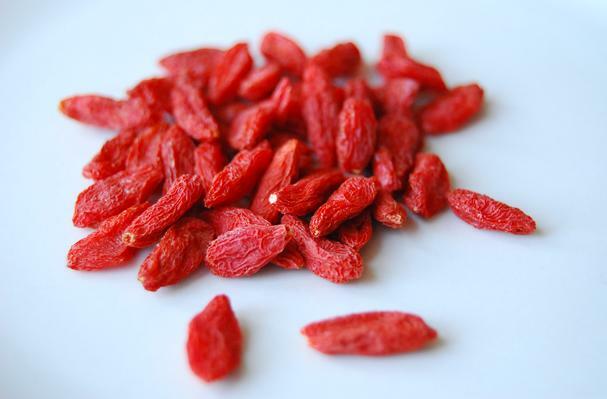 Outside of their native China, goji berries are most commonly found in dried form; dried goji berries are slightly sweet, sour and salty in taste. The are purported to be high in nutrients and marketed in Western cultures as a health food, while in China they are used for medicinal purposes. Colors: Range of reds, mainly dark reds. Mouthfeel: Earthy, Can be hard to chew. Choosing: Avoid dried goji berries that are a bright orange red, as this may indicate that artificial coloring has been added. Buying: Usually can be bought in bulk sections in Whole Foods or Central Market.